Today we start a new column in our blog devoted to MacPaw workers, the people who make magic here and bring you all the best they can do. Vasiliy Zubach (or simply Vasya) is one of our ingenious web developers who make us proud of our site and other web projects. We decided to start this section with his interview since now Vasiliy has gained popularity with his iPhone in pure CSS3 and simply because he was glad to be the first interviewed. Vasya, let’s start with your short bio. Well, I was a fifth child in my family and spent my childhood in Vorokomle, a little village on the west of Ukraine. At first I studied at a local school, but later I managed to move to Kyiv. There I joined my elder brother, who was already studying in a high school with a mathematical bias. After I ended the same high school I became a student of one of the top Ukrainian universities. Last year I’ve got a Master’s degree in information security. How did web development become your vocation? Soon after I’ve started studying at the university I decided to find a job. So I looked through the headhunting sites and found many propositions to join the companies that develop websites. That interested me, so I quickly studied HTML and CSS and sent a resume. Nowadays, I regret a bit I found my calling only then, maybe it would be better for me to understand I’ll be a developer when I was younger. How did you join MacPaw? Well, it was my old colleague who earlier came to MacPaw from our common previous job. He said the company needs another web developer. I agreed for an interview and the next day my current boss called and offered me to join the MacPaw team. What was the biggest challenge for you at MacPaw? I feel like every day is a challenge for me. Besides, I can’t stand the boring work, and there were no days at MacPaw when it bored me. Talking about our projects, it was interesting to create an iPhone widget for Ensoul.me. Our Ensoul Machine was also very challenging to implement. However, I can’t unveil all the details, but currently we’re working on a totally new web project that is build entirely on CSS3 scripts. All of our web developers are currently engaged in creating it and I feel like it can cause a real explosion in the Apple world. Do you have projects beside MacPaw? I like to devote all my ideas to MacPaw since I feel it is the company where I can entirely fulfill myself and my skills. However, sometimes I have ideas that make a little practical sense and are just interesting to implement. For instance, a CSS3 button or a CSS3 pager. My latest project was an iPhone made entirely in CSS3. Tell us more about your iPhone. 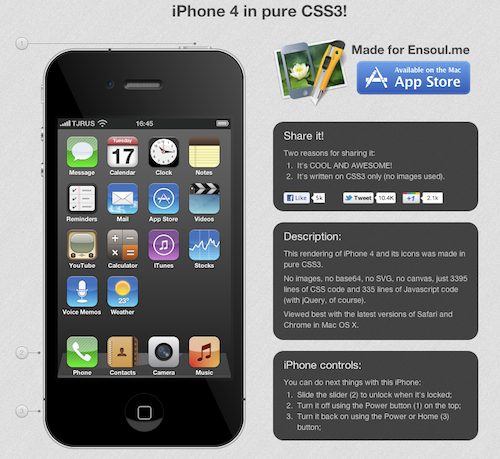 The main idea of this iPhone was that I didn’t draw it in any graphic program, I wrote it in CSS3 code. That means every icon, every line and every curve were described via CSS3 tag properties. To create such an iPhone I wrote 3395 lines of code. Initially, I wanted to draw iOS icons only, but that was already made by another web developer. So, I went further and implemented the whole iPhone with its sliding feature and turning on/off possibilities. My iPhone became so popular that since its launch a month ago my site was visited more than 370,000 times. Did you expect it will be that popular? Actually, no. I’m amazed and very happy my work was appreciated that much. There were days when people retweeted my iPhone every 10 seconds and even thanked me via email. Some of them said that my work helped them understand what their vocation is and what they should do in their lives. Such things inspire me a lot and encourage to create even more impressive stuff. And I feel like this is how the job should be done. Any app, service or any other product should not only work properly but also amaze people and make them actually want to use it. How do you plan to further improve your skills? Is there anything interesting for you besides web development? My work is my hobbie. Even when I’m heading to the office or back home I think about my work, about code, about algorithms. I can’t handle my desire to make things outstandingly good. However, I’m not a coding nerd. I also like reading books and watching movies that can touch one’s heart. My favorite book is “The Picture of Dorian Gray”, it always reminds me of a person’s duality and importance of conscience. And “The Pursuit of Happyness” is my personal story of success that inspires me when something seems impossible to be done. Regarding my music preferences, I’m not an aesthete and like HURTS and Pendulum as they allow me to concentrate better on work. What do you want to achieve with your work? What is the ultimate goal for you? Currently I work for the sake of my future and the future of my kids. I know I will never stop doing what I do as it is very interesting and absorbing for me. However, I really love my girlfriend and regret I can’t spend more time with her. She has always been inspiring me in everything I do and I’m extremely happy I’ve met her in my life. I know that someday I will achieve something that will allow me to spend as much time with my family as I want and to provide my future children with everything they will ever need and that I was devoid of. That is all for today. 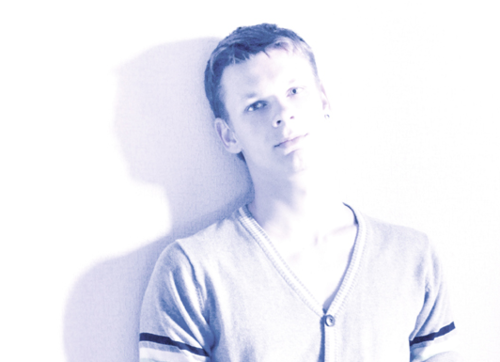 Thank you, Vasiliy, for such a sincere interview!